Andrew Sullivan’s The Dish published a map originally published in the most recent issue of Psychology Today. 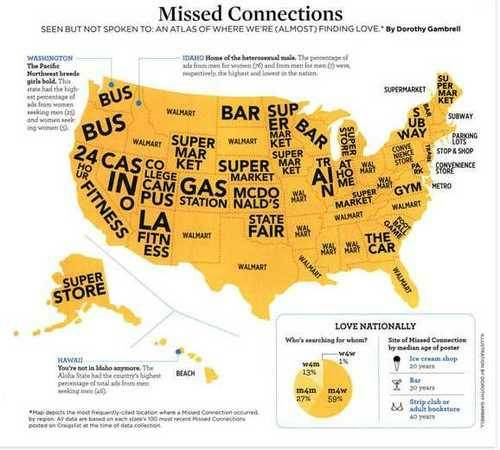 They dubbed it “America’s Saddest Map.” It showed the results of a scholarly serious-minded and smart cartoonist’s analysis of the Craigslist “missed connections” sections. Yes, it’s another example of the coastal “Let’s crap on the Walmart belt” attitude. But there’s more interesting stuff here. Let’s take a look at those Walmart numbers. If you look at the median income of all 50 states (the most recent three-year averages), you’ll see the first Walmart/Craigslist state doesn’t show up until all the way down at 32 — Texas, with a median income of $49, 195. In fact, 12 of the bottom 24 states in median income had Walmart as their highest-occurring missed connections word. What does that say? It says there’s a concentration in the South, where wages are lower, of course. But Ohio’s in there and so are Idaho and Montana. Are there depressed wages there? Certainly in Ohio, where good paying manufacturing jobs have been lost and in Idaho and Montana, as well, where there is no base for good paying manufacturing jobs. But it says something else. If you look at the states, you’ll see that with a couple of exceptions — Ohio, Texas, Florida, Missouri — those 12 states are places with one significant metropolitan area and widely dispersed populations. Even looking at exceptions, you’ll see deeply rural states. Missouri has two major metro areas, but has a fairly dispersed population outside those areas; Texas has 2 1/2 major metros (Austin being the half) and a widely dispersed population, and it’s very similar to Florida and Ohio. Ever been to a rural Walmart on a Friday night or Saturday afternoon? It’s the gathering place, a central place for the community. It’s the gossip center and a point of social concentration. In areas with dispersed populations, the Walmart is placed in a regional commerce center of a few thousand — the biggest area around. And it draws for miles. 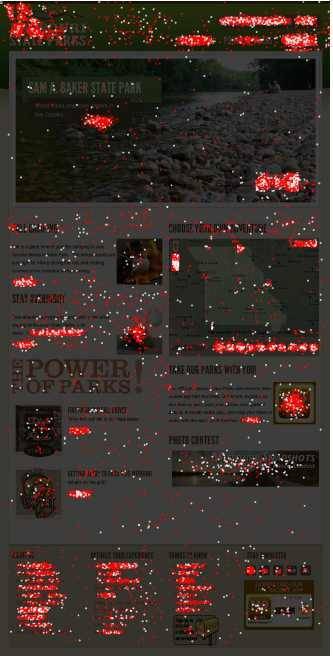 So when we get past the snark, the missed connection word study gives us a pretty good view of how people gather. Just like the highest occurring words in New York and D.C. and Washington and Oregon (all of which are dominated by single metropolitan areas with comprehensive public transportation systems) are about modes of transit.